After doing tests today, we have checked out that the printing quality of the latex 360 is less than the Latex 260. Specially with small letters for label printing text looks like that they are generated in a poor physical resolution (see attached picture, letters around 2mm). It is not a software problem, because Onyx and Flexi are delivering the same quality (as can be seen in the sample picture too). Nevertheless the printer prints in 600dpi, we have checked out that the processing resolution of the softwares are at maximum 300dpi. Perhaps this should be the reason for that? All RIP-Softwares I have tested (until now Ergosoft Posterprint, Onyx, Flexi) set the default resolution to 300x300dpi. Reset that resolution to 600x600dpi (I think this don't mean the printing resolution, it means the resolution of the contone file) will solve the problem. Buenas tardes, prueba subir un poco mas la temperatura durante la impresion. Da el aspecto de que la tinta no esta bien anclada sobre el soporte. Thank you for your feedback. It is not a problem of the temperature, it is a problem of the resolution of the contone file sent to the printer. Hi TG-Frank, sorry for the delay, but we've been doing some test in the lab, and our engineers arrived to the same conclusion as you. They recomend to use 600 dots per inch of render resolution when printing at 8 pass or more, in order to get the best results. They've check it using the Scanvec/SAi (flexi) printing at 16 pass. Hi HP-MarcM, thank you very much for testing and confirming. No problem with a delay of one day . 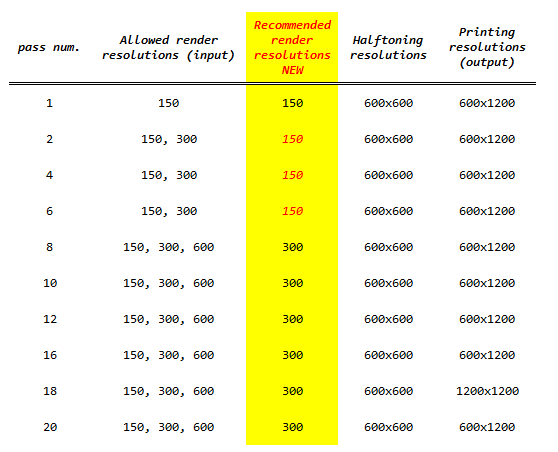 But your table still shows 300dpi as the recommended render resolution. Could be a suggestion to set new defaults in the recommendations for the drivers. I have tested with Onyx (Beta Driver), Ergosoft (Beta Driver) and SAi, and every of that RIP's defaults to 300x300dpi (Ergosoft shows 300x300dpi as "recommended"). Specially in Onyx it is a little bit uncomfortable to switch to 600dpi on the fly. I'm happy to see that someone on this platform takes care of questions. We are dealers in switzerland, and one of our sales contacts have sent me to log in here. Good idea. Recently I did tests both L360 and 26500 using the same files (skin tones) iand the conclusion was as follows (theory): Because the L360 has ONLY ONE printhead for light colors (nobody warn about it) and HP increase the speed sacrifing quality using more magenta and cyan ink in midtones prolfiled curves created for HP infernal software. Is almost a four color printer using just a little bit of light color in low densities. The L360 has better dot size BUT use more cyan and magenta in mid and darker tones generating a graininess aspect. The test was conducted using 16 passes in L360 vs 12 passes in L26500 on avery and Ritrama vinyls. I'm very concernd because I was expecting better quality at better speed with better color. HP sacrificed quality. They increase speed and give us more color consistance. I think that is necesary add the missed printhead (Lc/Lm), reprofile medias using better curves for midtones using more light colors (through firmware updates). That's my theory and the case was open recently to know HP explainings. Image-quality maintenance --> Vertical correction. If the problem persists, I will recommend you to have a look on the "graininess" section of the user guide in which you will find some tricks to avoid this problem. Finally, if nothing works; I will like you to contact with your support team in order to fix the problem. The main point for the lights is not how many pens do we have but how much ink per colour do we spit. The ink limit for the lights (drops/pixel) is always lower than for CMYK. Taking into account that we have just one Lc/Lm pen for the Latex 300 therefore it increases the lights usage which minimizes any possible pen starvation issue. Added to this not introducing a second pen for the lights reduce cost/copy and avoid x-contamination with the optimizer." I hope this answers can help you!